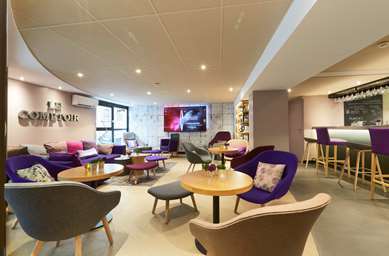 The Next Generation Campanile Hotel & Restaurant LYON SUD - Confluence - Oullins is 850m from Oullins railway station, 6km from Lyon city centre, 8km from Part Dieu TGV high-speed railway station and 32km from Lyon St Exupéry airport. 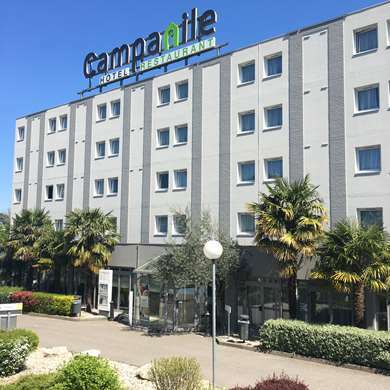 The Campanile Hotel LYON SUD - Confluence - Oullins is very easy to get to and therefore provides the ideal setting for both your business and leisure trips. It provides a relaxing stopover if you are travelling along the A7 motorway. As the hotel is close to Lyon, which is on the UNESCO World Heritage list, you can explore Lyon old town, Fourvière Basilica and the Confluence development, as well as local gastronomy, with the Paul Bocuse indoor food market and the "bouchons" (small, traditional restaurants serving regional specialities). Another distinctive feature of our hotel in Lyon Oullins is its "green wall", a living wall of plants, which helps to control the temperature of the building and incorporates a biologically diverse ecosystem into the hotel. The wall is maintained with collected rain water. 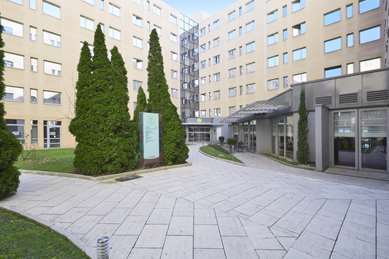 Our 3 star hotel in Lyon Oullins has 123 modern and soundproof rooms. Many amenities are available free of charge. The hotel has interconnecting rooms which are ideal for families. The hotel's restaurant and lounge bar are pleasant places to relax. The restaurant serves contemporary, natural and seasonal recipes, created by Michelin-starred chef Pierre Gagnaire. The restaurant seats up to 100 guests. 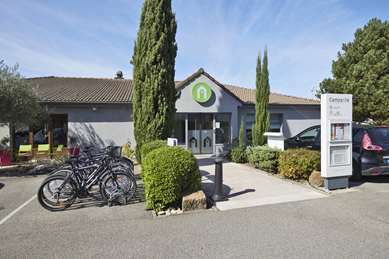 The hotel has three spacious and soundproof conference rooms, which look out over the banks of the Rhône and are equipped with a flip chart, video projector, wall socket and free Wi-Fi. The total area of the rooms is 125m²and they can accommodate up to 100 guests. Choose from our range of conference packages, which can include room hire, study day tariffs, residential tariffs and drinks receptions. The hotel is accessible to guests with reduced mobility. Our friendly, bilingual team is at your service to ensure a memorable stay at our Campanile Hotel LYON SUD - Confluence - Oullins. The hotel has 123 modern and soundproof rooms. The rooms feature Wi-Fi, an LCD television with more than 50 international channels and a Bluetooth connection which allows you to connect your smartphone to the television, all at no extra charge. The spacious rooms feature top-of-the-range bedding (including a Simmons Dorsopedic mattress) and a private bathroom with bath or shower and hair-dryer. The hotel is family-friendly and has triple, quad and interconnecting rooms. Choose your own breakfast from our all-you-can-eat buffet. 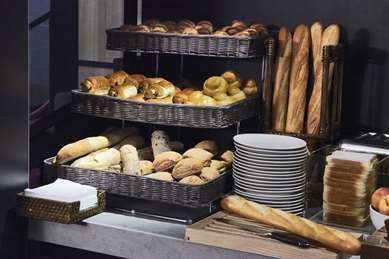 Your Campanile hotel offers a complete breakfast buffet for a great start to the day. Create your own breakfast from our range of fruit juices, hot drinks, cereals, pastries and cold meats. Available: 6.00 am to 9.00 am on weekdays and 6.30 am to 10.00 am at the weekend. A late breakfast is available every day from 9.00 am on weekdays, and from 10.00 am at the weekend, until 12.00 in the Lounge Bar. Le Restaurant Campanile satisfies all appetites with its à la carte dishes, set menus and sweet and savoury gourmet buffets. The restaurant is open for lunch between 12.00 pm and 2.00 pm, and for dinner between 7.00 pm and 10.00 pm. Our friendly Lounge Bar is ideal for business meetings or relaxation. It is open from 7.00 am to midnight and offers a menu of imaginative, tasty dishes you can enjoy at any time. Coming from the north, take the exit 3 on the highway A7. At the traffic light, turn right. The hotel is located at 400 meters.